It’s amazing what a single slice of our Tuscan Boule brushed with olive oil and crushed toasted fennel and used to scoop out a dollop of garlic-laced lemony crumbled feta cheese & hummus dip can do to your senses. Close your eyes and imagine yourself on a hillside villa in Tuscany, at sunset. Or, keep your eyes open and avoid the stares from passers by. However you enjoy it, it won’t be the last. Toast fennel seeds in a dry skillet over high heat until golden and fragrant. Transfer toasted seeds to a mini food processor, add pepper and pulse together until almost fully ground. (Leave some fennel in larger pieces, this will add texture to your crostini) Pour into a bowl and stir in ½ cup of olive oil. Pre-heat oven to high heat broil. Slice bread into ¼ inch thick slices and cut each slice in half diagonally. Working in batches, place bread slices onto a baking sheet. (*Do not line baking sheet). Generously brush both sides of bread slices with fennel oil mixture. Place under broiler and toast until golden, approximately 1 minute. (*Watch to prevent burning.) Remove baking sheet, flip bread and broil other side. Set bread slices on a cooling rack and continue with remaining bread slices. Place 1 tbsp. olive oil, 1 cup of feta, hummus, lemon juice and garlic in a mini food processor and pulse until smooth. Season with pepper to taste. Transfer to a serving bowl, garnish with reserved feta, black pepper and drizzle with olive oil. 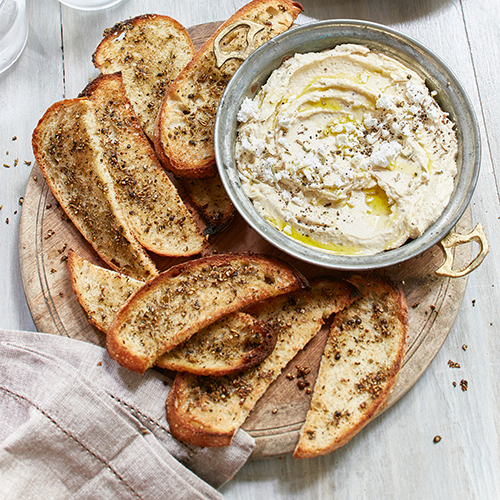 Serve bread with feta hummus and enjoy! *Tip: Freeze fresh for 5-10 minutes or use day old boule before slicing. This will make it easier to cut.